You can reach more people. I don’t know about you but I love what I do. I love working individually or in a small group with clients and really getting to know my clients. I love helping people in their Pilates and movement journey. One of my biggest frustrations as an instructor and as a business owner is that there are not enough hours in the day for me to share my movement love with EVERYBODY!!! I love the idea that by sharing my ideas and passion in writing I can reach more people!! It lets people get to know you and your business. Getting to know people and connecting with people is what life is all about! I would love to have plenty of time to talk to all of our clients and potential clients in person but in reality this is not always realistic. But when people can read about me, my passions and my ideas we “connect”. Clients and potential clients have a better idea of what my business is about, why we do what we do at Rivercity Pilates and how they will get treated when they walk in our doors. Many new clients often say they feel like they know me a little bit before they meet me. It’s never easy walking into a new place or starting a new fitness program and I love that people feel more at ease because they’ve been able to read some of my blogs and learn about me! Reaching more people and letting people get to know more about me and what I am passionate about ( #1 and #2) brings more people to my studio and grows my business! I’m able to do more of what I love and get paid to do it( simply amazing!). My reasons for Pilates instructors to blog are pretty simple and seem pretty obvious. But if you are an instructor or business owner who is trying to do more of what you love you may be feeling overwhelmed at the idea of blogging more when you are contemplating adding it to your already full schedule! I’ve been there and I can relate! Hiring someone to help me organize, edit, plan and market my blogging was one of the best things I’ve done! For me the writing portion of blogging usually comes pretty easy. When the content I’m writing about is related to my passions it’s usually not too hard for me to write. The challenges for me were often editing what I wrote(to make it look nice and appeal to my ideal client), planning the posts on a regular basis, ideas for topics and promoting the posts so that they actually got read! Working with Becky we have created a great system that allows me to write, while she takes care of the rest. Before Becky and I started working together it was my goal to post 2 blogs per month (and even that didn’t always happen!) Now we regularly post 3 -4 blogs a week! AND I’m not ever stressed about blogging as we usually are scheduled ahead for over a month of content. 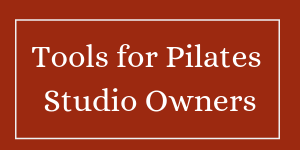 If you are passionate about teaching Pilates and being able to make a living doing it, it’s definitely worth it to figure out how you can add blogging into your business plan! !